Located in the South Central part of the U.S, Oklahoma is a prominent state that has a diverse economy base. Biotechnology, telecommunications and aviation are some of the industries in Oklahoma that have considerably grown over the past few years. Individuals who seek to become a part of the healthcare sector in the state can enroll in the nursing programs and acquire skills essential to work as nurse in Oklahoma. Health services in the state are likely to have the largest gains between 2012 and 2022 (the Oklahoma Employment Security Commission, 2014). So enrolling in a program in health-related field can be a suitable option for Oklahoma students. Nursing schools in Oklahoma offer traditional degree and certificate programs and also have the online and hybrid learning options. Ranging from the LPN programs to PhD degrees, Oklahoma nursing schools offer a variety of programs that allow students to prepare for the nursing practice. Students get opportunities to develop an understanding of nursing care and also acquire a variety of skills essential to work with patients and other healthcare team members. Focusing on providing an insight into nursing care, the nursing schools in Oklahoma offer a variety of degree programs that include classroom based instruction as well as a supervised experience in hospital settings. Students also acquire leadership, problem-solving as well as communication skills in addition to learning how to care for the patients in different healthcare settings. Undergraduate nursing degrees are suitable for students who want to pursue a career as a registered nurse (RN). RNs work in hospitals, offices of physicians and other settings where they administer patients medicines and treatments, set up plans for patients’ care and observe patients and record observations. Students in the RN programs (the associate and bachelor’s degree) receive instruction in anatomy, physiology, microbiology, nutrition and other social and behavioral sciences, as well as in liberal arts. Completing RN programs allow learners to sit for the National Council Licensure Examination, or NCLEX-RN exam. RNs can pursue the master’s degree programs that focus on advanced concepts and practices of healthcare. These programs can be suitable for those who want to specialize in a particular area within nursing while PhD programs allow students to prepare for positions in teaching or research. Nursing schools in Oklahoma also offer LPN (licensed practical nursing) programs that are designed to provide learners with foundational knowledge in nursing practice. Upon completion of a LPN program, students can sit for the National Council of State Boards of Nursing (NCLEX-PN) exam, which candidates have to pass to obtain their LPN license. How much do nurses make in Oklahoma? 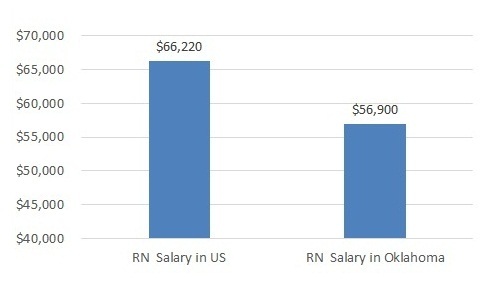 Registered nurses in Oklahoma in 2013 earned a median annual salary of $56.900 or $27.34 per hour. RNs nationally earned a median annual income of $66.220 or $31.84 per hour, in 2013.